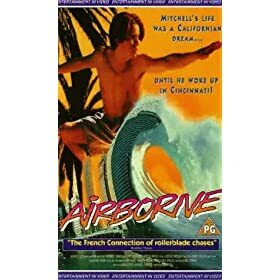 Few movies exemplify everything I wanted to be when I was 10 years old more than Airborne. Not only was the main character Mitchell, played by now-real estate agent Shane McDermott, living in a cold town in Ohio (Cincinnati about four or so hours from Toledo), but he was also really good at surfing and rollerblading. I was always really, really into watching rollerblading, skateboarding and BMX competitions on ESPN2 back then (this was around the time the XGames started I guess), but was always too much of a wuss to try anything more than going kinda fast (plus I could never get myself going on a skateboard). So, right off the bat, I gotta say that Airborne gets Best Of The Best status for purely nostalgic reasons. It’s not a great film, but it’s great to me. In addition to all the rollerblading stuff (the race in the end is EPIC), you’ve got all the usual teenage, non-sexual mellowdrama you’d expect from a PG movie from 1993. It also features early roles by Seth Green and Jack Black. I’ve liked a lot of Seth’s later work, but this one’s still my favorite. Damn, I don’t even know where to go from here. I was able to watch this thanks to Netflix’s Instant watch and all kinds of youthful memories flooded back to me (the scene where he’s “surfing” on his bed, but imagining the California waves of his home? awesome). There’s also a really funny scene where Green’s trying on clothes for them to go on a double date. It’s you’re basic montage, but it’s almost identital to the one in Def By Temptation. Anyway, I can’t recommend Airborne to everyone, but if you haven’t seen it and any of the following interest you at all, you should check it out. Anyone else unhealthily obsessed with this flick? I tried to get Em to watch it, but she kept making fun of me so I had to turn it off and finish it later. ← Boogie Down With Barry Ween!